Who does not know the dance of Bali. Almost every religious activity, is always accompanied by dance. For the Balinese, dance is an offering as they present offerings. Broadly speaking, Balinese dance can be categorized into three groups, namely dance trustee, baebali dance, and dance balihan. Are classified as wali dance among others Sang Hyang Dedari, Berutuk, Baris Gede, and Rejang. Belonging to the mask dance bebali Pajegan, Wayang Wong, and Gambuh. While dance balihan among others Parwa, Legong, Prembon, Joged, and Arja, as well as a variety of modern dance choreography. 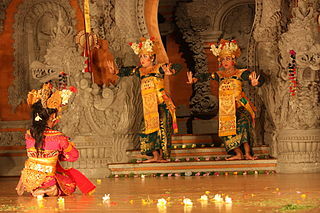 Legong is a classical dance of Bali which has a lot of very complex motion. The motion tied with percussion accompaniment structures said to be the influence of dance gambuh. The word comes from the word Legong leg which means flexible or elastic and then interpreted as graceful movement. Legong developed into Legong Kraton. This dance is performed by two or more girls with Lean figures show as the opening dance. In other situations, Legong dance performed one or two pairs of dancers without Lean figures show first. Legong hallmark of this is the use of fan dancers. Barong is a character in the mythology of Bali. Barong is the king of the spirits and symbolizes goodness which is symbolized by the evil enemy of Rangda. The most popular barong is shaped like a lion. Barong is derived from gianyar, the area where a variety of Balinese art centered. In Calonarong or Balinese dance, Barong uses witchcraft to defeat Rangda. This dance was created in 1930 by Wayan modulus and Walter Spies. This dance is a dance development Trance Ramayanan the loaded story. Wayan modulus popularizing this dance while traveling the world with his troupe of Balinese dancers. Most of the Kecak dancers are male. The dancers sit in a circle and with certain rhythm called “cak”, raising both arms. This monkey troops who helped Rama defeat Ravana abducted Goddess Sita. The dancers are dressed in fabric sitting around the box like a chessboard their waist. Besides the dancers, there were other dancers who portray such Rhama Ramayana, Ravana, Shinta, Jatayu and Hanuman. Oleg Tambulilingan dance is a dance that tells the story of a princess who was awaiting the arrival of preening preparing lover. This dance tells the lovers as a couple and a flower beetle. As usual female dancers from Bali, the clothes will visible the armpit and shoulders. Plus a wobble and a challenging stare with a slight smile. - Bona Banjar Kangin Gianyar, every Monday and Wednesday also Friday at 6:00 p.m. to 7:30 p.m.
- Ubud kelod, Tuesday at 7:30 p.m. to 8:00 p.m.